In total 8 projects received research grants in the DeepNL programme. With this programme, NWO is responding to the advice of the Dutch Safety Board to ensure a structural and long-term research programme into the problems related to gas extraction in the province of Groningen. 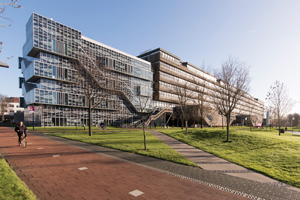 Senior researchers within the 5 CEG projects are Femke Vossepoel, Ramon Hanssen, Michael Hicks, Jan Dirk Jansen and Kees Wapenaar. Together with 15 PhDs and postdocs they will perform laboratory experiments and fieldwork and use computer models over the next four years. What happens to the Dutch subsurface when used for the production, injection or storage of fluids? Does suddenly stopping production from a gas well in Groningen also stop earthquakes or may it provoke new ones? What are the effects of production and injection during underground gas storage? How does reservoir rock behave under fluctuating stresses? Our Science4Steer research addresses these questions with laboratory experiments and computer models to help society make better decisions. Many aspects are important in such decisions and many factors contribute. The role of science is to provide understanding how we can steer subsurface activities safely. Subsidence: nuisance, tell-tale, or resource? Subsidence is an inconvenient consequence of exploitation of the subsurface. By the same token, it is one of the most important sources of information to understand subsurface behavior. Using satellite data and advanced subsurface models, we investigate how to optimally integrate improved observational and modelling methods to understand what lies beneath. This study investigates how accounting for spatial variations in material properties in the shallow subsoil and specific characteristics of sand and clay layers (non-linearity, degradation), combined with aspects found in induced earthquakes (repeated, short-duration loading), can lead to a more accurate quantitative prediction of the motion and deformation at the ground surface. It involves the development of a reliability-based analysis framework to assess the influence of the shallow subsurface and its variability. The design of a new dynamic testing facility, combined with laboratory testing, field tests and the development of material models will provide industry guidance and prototype analysis tools. Gas production can lead to fault slip in the subsurface, which can result in earthquakes. By combining measurements of fault slip in a laboratory with realistic physical models of fault behaviour, we can refine its properties and variables. This allows to better understand the processes at the fault’s interface. The aim is to provide probabilistic estimates of fault slip occurrence. This research will provide a decision-making tool that through considering different gas-production scenarios will help to minimize the effects of earthquakes for society. Forecasting the ground motion in Groningen. With this research we aim to improve the forecasting of ground motion in Groningen, caused by possible future earthquakes. This requires understanding of the onset of seismic activity in the deep subsurface, the propagation of seismic waves through the layers of the earth and how these waves lead to ground motion. To this end we develop a new forecasting methodology, which combines laboratory experiments with seismic modelling and monitoring techniques. This research contributes to a better understanding of the relation between human intervention in the subsurface and its effects at the earth's surface.